High in the Sierra Nevada mountains rests the super secret creative and innovate minds of the Q12 Team. Imagine, The Riverfox™ Project, the clandestine modern research center for the Q12 Team sequestered in a massive secluded cave with the latest scientific experimentation and multi-talent anti-terrorists products including the research on Rat Pheromones, lethal miniature clandestine instrumentation and beyond. Totally self-sustained with solar energy. Easy access with security clearance is by in-cave heliport for helicopter transport. Summer mountain road access is difficult. Winter access is by snow tractor but treacherous. Safe house, San Francisco and Washington D.C.
Q12 Safe Houses in San Francisco and Q12 Washington D.C. The “Phantom Rats of Washington D.C.
Felix of the Q12 Team. Note size of micro chip on penny. 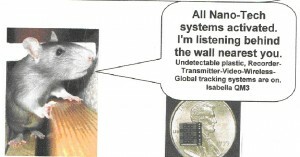 The micro chips imbedded in these sterilized clandestine laboratory genetically trained DNA-scent-pheromones rats carrying implanted undetectable digital, Quantum Nano-Technology plastic receivers-recorders-transmitters-videos-global tracking, are tracked to clandestine previously implanted pheromones scented on specific, people, departments and targets. For lethal extermination of non-complying or captured rats, they contain GPS remote control self-destruct odorless mummifying chemical agents. The “One Mile Circle of Power”™ and The security of the U.S.A.
Where is the Q12 Riverfox™, San Francisco Safe House and the Washington D.C. Safe House? They have no street or internet address, no name or number. Admission by Invitation only. The “Mole Digger”™ The American Secret Ghost Government of Foreign Agent Lobbyists. The Q12 Team term for “Lobbying Intelligence”™ is broad and inclusive but not limited to the concept of Public relations Journalism, Spy-Spin™ Intelligence, Espionage, Government Affairs-Relations Analysis, Propaganda, Intrigue, Treason and a whole lot more. Some unique features about the Q12 Team. For a Lobbying Intelligence Services firm it appears to make every effort not to be noticed. It is a registered corporation in Delaware. Domiciled in Dubai. Elaborate Offices on the 9th floor, of K Street with safe houses every where. It is not a registered law firm, but does have contracted attorneys on staff. Is in an independent association with law firms. Not a registered Domestic or Foreign Agent Lobbyist. Provides Lobbying Intelligence, Marketing-Consulting and Government Relations. Principle agent is Dominic Sebastiani. Personnel Records are sealed and vague. No web site or known personal email addresses. But elaborate advanced network technology. Appointments are made for all clients’ at their convenience and at any hour. Guaranteed limousine pick up service at all hours and at any airport for commercial or private aircraft. Need we say more regarding The “Mole Digger” on the art of confidentiality?